Usually my 10 year old daughters take in a little Valentine’s gift or treat for all the kids in their class (last year’s treats here). But this year things have changed a little. It seems as though the thought of giving the boys anything to do with love or fondness is something that makes their little cheeks turn pink. They say the boys are silly, not interesting, noisy and smelly. In other words, they’re starting to NOTICE them. Oh gosh. So together with my daughters we came up with a these little puffed heart necklaces that they can give to all the girls in their class. It’s a quick and simple project that my daughters helped with and the result is absolutely adorable. 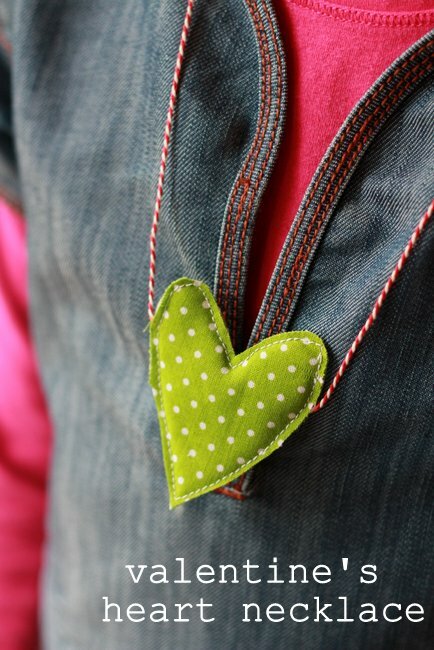 I can just imagine their little group of girlfriends walking around school on Valentine’s Day with these little coloured fabric hearts hanging around their necks. I cut the cotton batting heart slightly smaller than the cotton hearts so that there was no risk of it poking out after being stitched. 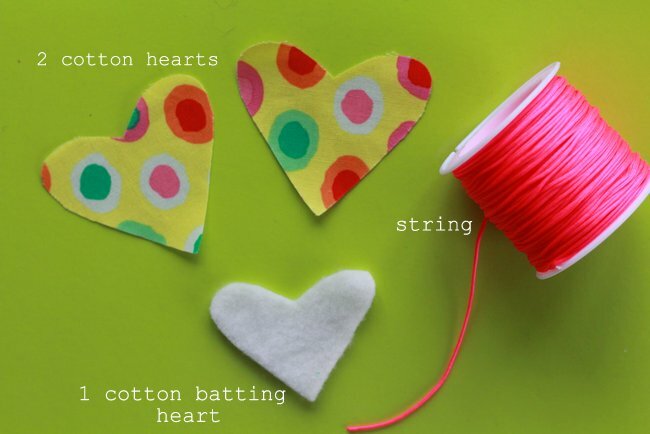 Now you just have to layer all the hearts and string. Put the first cotton heart right side down then place the cotton batting heart on top. Next place the string across the middle (or slightly higher up) and then the last cotton heart on top (good side facing up). 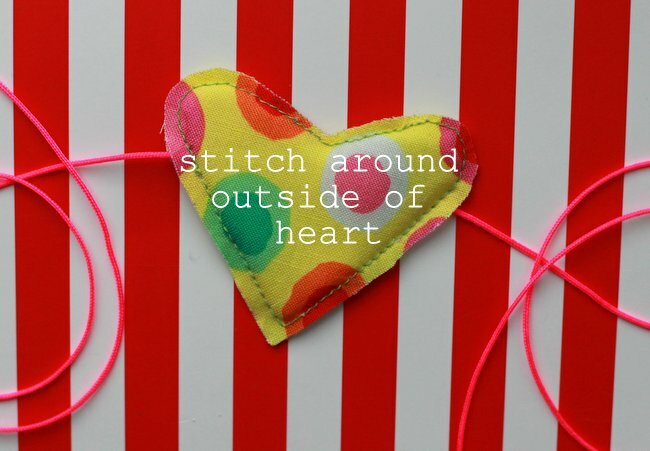 Now you just have to simply stitch around the outside of the heart. For some I used the zigzag stitch instead and it also gave a nice effect. 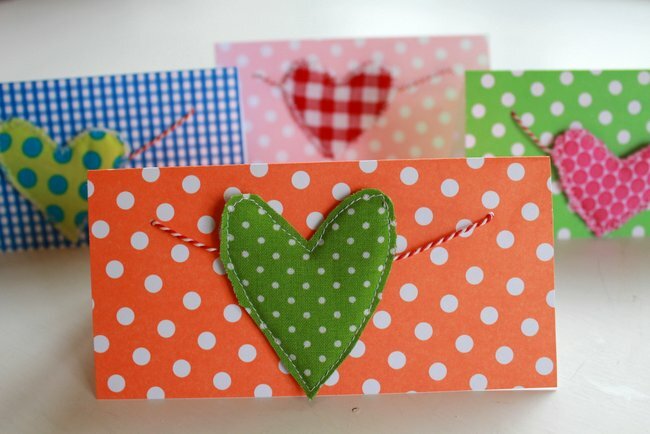 We then took some heavy card stock to make little Valentine’s Cards in which to give the necklaces. We punched two little holes near the top to pass the string through and used Washi tap to fasten the rolled string on the other side. You can add little messages and notes inside the card as well. oh my, these are delightful. Is it OK to send the boys in the brown sugar, jam filled hearts or are they completely out in the cold? Out in the cold I’m afraid. You can’t even mention the boys in their class to them. The eye-rolling and the changing of the subject is hilarious. poor boys, lucky girls. That’s what they get for being so smelly and weird. I totally agree with you girls. They are smelly aren’t they? hihi, your girls are true teenagers now! The little hearts are so sweet! Lucky girlfriends! Teenagers! Yikes…that’s a scary word! Thank you! 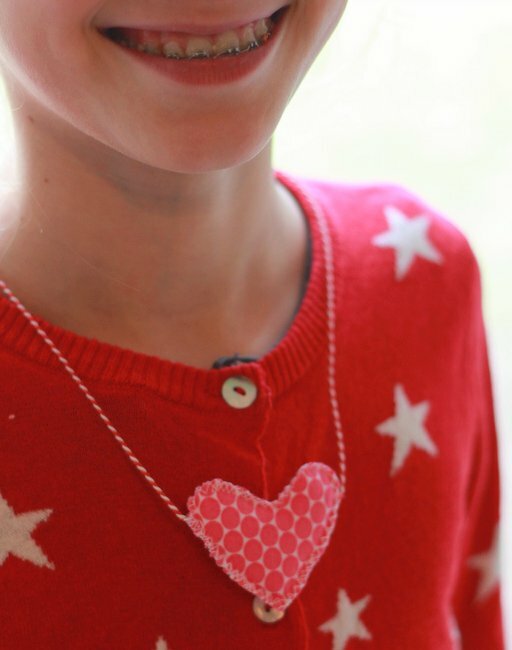 I think seeing a gaggle of 10 year old girls with heart necklaces will be really sweet. Must try and get a photo! You have your valentines made three weeks ahead of time? SO impressed! These are lovely. 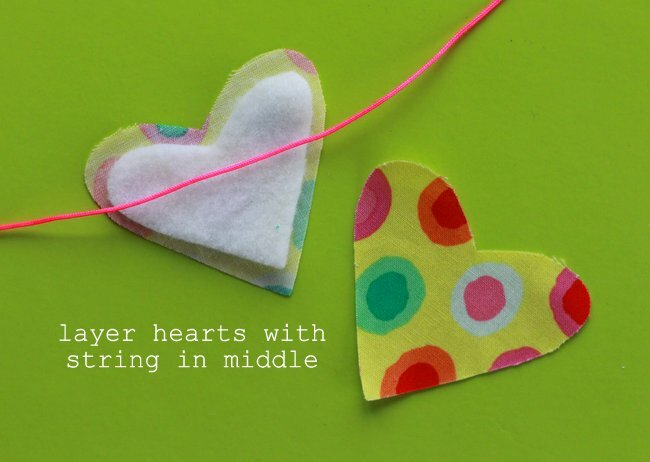 We have lots of fabric scraps around these parts that we could turn into hearts. Great idea. After 5 weeks of no sewing due to broken wrist I was in need of a sewing project that was quick and painless! And I have to admit it feels good to be ahead of schedule for once! These are totally adorable! Love the idea. I may make them with felt and ribbon I already have. Thank you for sharing!! such a beautiful hand made heart necklace. This is the best present to gift her/him to show your love or feelings to her.